This tray is unique and very whimsical, I can honestly say I haven’t seen any other trays with quite this much character. 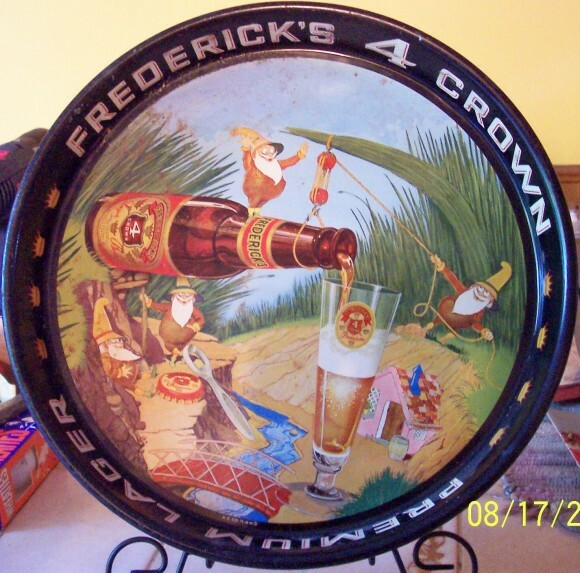 While most trays stick to pretty standard themes such as ladies, animals, logos, etc this one breaks the mold with a group of gnomes who have gotten a hold of a bottle of Frederick’s 4 Crown Premium Lager by Ambrosia Brewing Co. and distributed by Fredrick’s Brothers, Inc. of Chicago. The tray dates to the 1940s and is a 13″ round manufactured by American Can Co. The best thing about this tray? It can usually be acquired for less than $100.